Remember when George Bush got so savagely attacked for taking a few moments to collect himself after learning about the 9/11 attack? You can bet your last dollar that if the US is attacked by terrorists while Obama is president, he will be staring vacantly into his teleprompter, desperately hoping it will tell him what to say. We don’t have a real president any more; we have in place of an actual leader the Teleprompter Of The United States (aka TOTUS). He says whatever it tells him to say. He is clearly not in charge of anything. Yep, TOTUS was hauled into a school. There’s a video of the speech at the White House website. 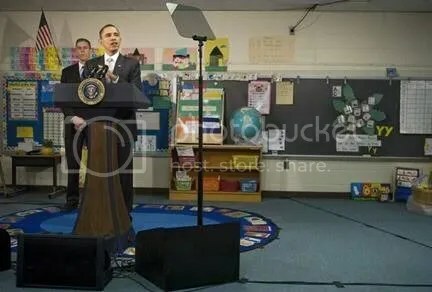 They even had to haul in the podium with the seal, and bring in the speakers that would create that resonating reverb, so Obama could pull off the illusion that he was actually someone important to the kids. Now, as dumb as Democrats want to assert George Bush was, the man had enough intellect to be able to communicate to a tiny little audience in a tiny little classroom without suffering from a teleprompter addiction.